This is a super-easy and delicious high-protein snack that goes well with all sorts of condiments, particularly hummus. The various types of seeds, plus the homemade za'atar, which is made with fresh herbs as opposed to dried, is what gives this recipe a particularly vibrant flavor. 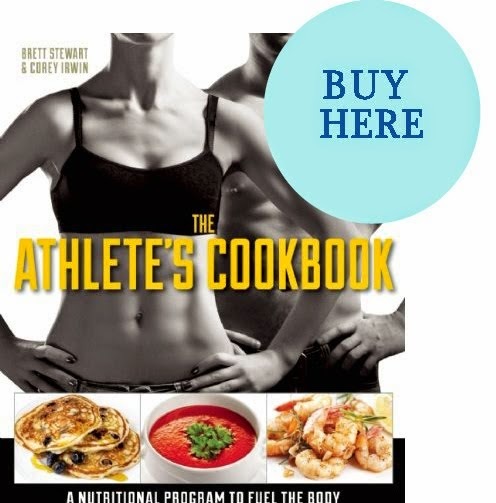 This is yet another recipe from The Athlete's Cookbook. Not only is this recipe rich in protein, but it's packed with antioxidants as well. Since it's important to get protein into your system within 15 minutes of finishing a workout, it also makes a great post-exercise recovery snack too. Just be sure to ingest some carbs along with it, (in a 4:1 carb to protein ratio), to replenish your depleted glycogen stores. 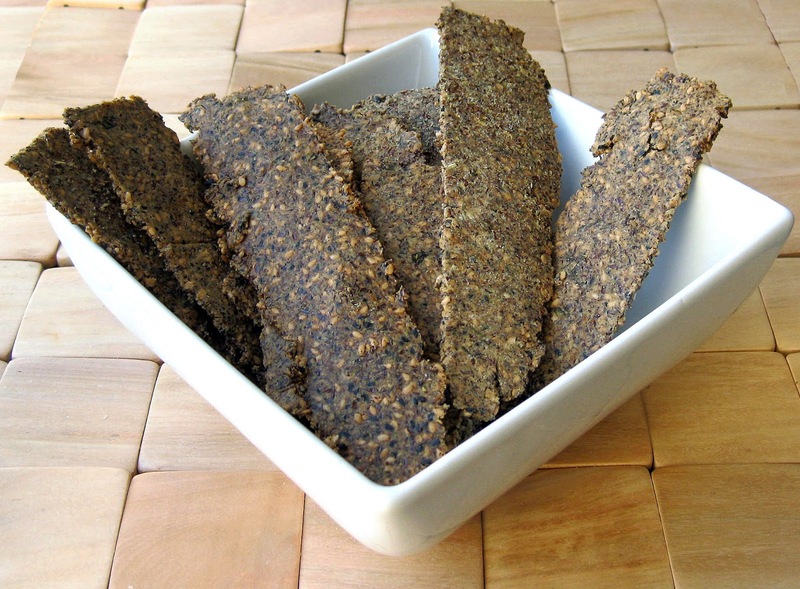 Included at the bottom of this recipe are vegan and Paleo adaptations of this snack as well. Directions: Preheat oven to 375°F. Place all za'atar ingredients and all dough ingredients, minus the whole (sesame, nigella, caraway and cumin) seeds, into a food processor and pulse until all of the ingredients are fully incorporated and form a dough ball. Add whole seeds and pulse until just combined. Remove dough ball from the food processor and place onto a flat, clean surface that’s been covered in parchment. Place another piece of parchment on top of the dough and press down on top of it with a rolling pin until flattened. Then proceed to roll out the dough with the rolling pin until it’s 1/8” thick. Peel off top sheet of parchment paper and cut into 1 - 1 1/2” wide strips. (If you’ve rolled out particularly long strips, it’s a good idea to also make a horizontal cut across the center of the flattened dough, so that the dough strips aren’t too long and unwieldy to transfer to the baking tray.) Line a 11” x 17” metal baking tray with parchment, then dust it with 1/4 c. ground flaxseed. Slide a long spatula underneath each strip of dough and transfer it to the baking tray, spacing them evenly apart. (Depending upon how you’ve rolled out the dough, you may have to bake them in batches or use two baking trays.) Place the crackers into oven and bake for about 10 minutes, or until golden brown. Serve and enjoy! Yield: About 30 (1 1/2” x 4 1/2”) crackers. Chef’s Notes: You can also prep the dough in advance and either chill or freeze it until you’re ready to make the crackers. Also, please note that za'atar typically contains sesame seeds. However, since I've already included them as a cracker dough ingredient, and didn't want them to be pulsed into oblivion along with the fresh herbs in the za'atar, this is why the sesame seeds are supposed to be added later as a separate entity, along with the other seeds. Adaptations: To make this recipe vegan, either use an egg substitute like Ener-G Egg Replacer or prepare the following homemade egg substitute: Pour 1 Tbsp. flaxseed into a small bowl, add 2-3 Tbsp. water, and stir until well-combined. Allow mixture to sit for about 10 minutes or so, or until it puffs up a bit and forms a gel. This mixture will take the place of the egg as the binding agent for the crackers. To make this recipe Paleo, simply omit the salt and the baking soda. Your crackers will be a bit flatter without the baking soda, but if you'd prefer your crackers to be a bit thicker, then roll them out to the desired thickness, which after baking, will remain about the same.